Governor Ayodele Fayose of Ekiti state has reacted to reported plans by Buhari government to suspend implementation of anti-open grazing law in states. The Federal Government is considering the suspension of anti-open grazing law passed by the some states over incessant killings. This was part of the discussion at the security council meeting President Muhammadu Buhari had on Tuesday with all the service chiefs in attendance. The anti-grazing law is already operational in Benue, Ekiti and Taraba states. In Ekiti State, the law, signed by Governor Ayo Fayose in 2016 prohibits open-grazing between 6pm and 7am. 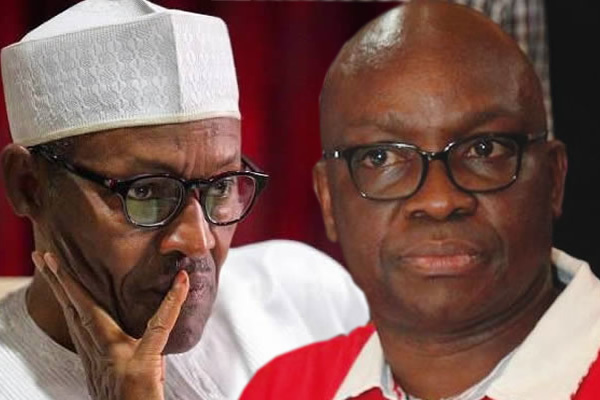 Reacting, Fayose criticised Buhari, questioning why the government is holding on to nomadic cattle rearing, and vowing that the anti-open grazing law stays in Ekiti. He urged Buhari to provide a decent life for herdsmen by adopting cattle ranching. “January this year, the Minister of Defense blamed passage of anti-grazing law in some states as the cause of killings by herdsmen. Today, he is still singing the same song. Is there something to this old system of nomadic cattle rearing that they are not telling Nigerians? “Why is Buhari not rearing his cows through open grazing? Why is it so difficult for the FG to support cattle ranching? “Here in Ekiti, the Anti Open Grazing law stays. It is the Presidency that should stop looking the other way while herdsmen go about killing Nigerians. “Methinks the Presidency should be concerned about how to take the herdsmen out of the bush and give them decent life by embracing cattle ranching. “How can anyone be pleased subjecting his own people to a life of following cows through the bush from Yobe to Lagos? “And our President will open his mouth today and say that Nigeria is safe and secure? I doubt if the President reads newspapers,” Fayose tweeted.